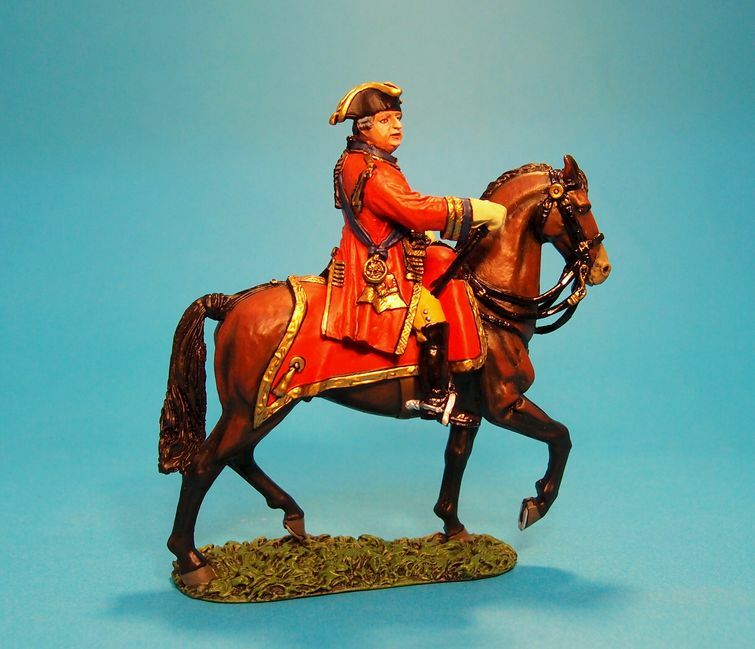 This figure is based on the painting by David Morier of William Augustus, Duke of Cumberland at Culloden. The Second and favorite son of King George II. By 1745 he was colonel of the 1st Footguards and Captain-General of British Forces at home and abroad. His father had brought him up to be a conscientious soldier and throughout his career he relied very heavily on the advice and support of an “Old Army” mafia of professional soldiers. The result was that he turned into an excellent administrator and a solid if uninspiring commander. He is generally best remembered for his role in putting down the Jacobite Rising at the Battle of Culloden in 1746, and as such is also known as "Butcher" Cumberland. Cumberland ordered his troops to show no quarter against any remaining Jacobite rebels (French Army personnel, including those who were British or Irish-born, were treated as legitimate combatants). The British Army then embarked upon the so-called 'pacification' of Jacobite areas of the highlands: all those the troops believed to be rebels were killed, as were some non-combatants, 'rebellious' settlements were burned and livestock was confiscated on a large scale. Some in the highland Jacobite regions survived the redcoats' ravaging of the countryside only to starve the following winter.